We went to an Italian Deli & Market recently and I decided to pick up a box of Arborio rice. I've never cooked with it, but I wanted to learn how to make Risotto. I've been reading lots of online recipes from some of the best chefs, and finally, today is the day. 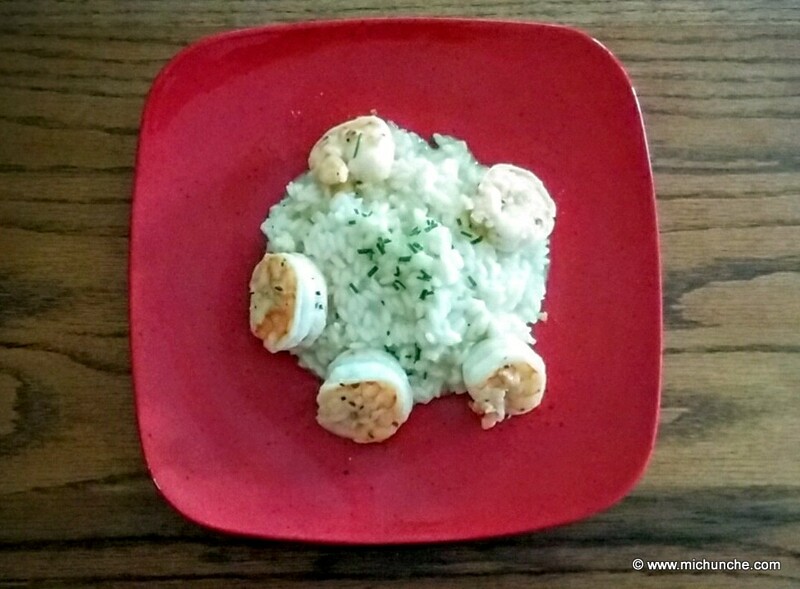 I made a delicious risotto with pan seared shrimp for lunch. I was surprised at how easy it is to make. It just takes time, but now that I've mastered this, we'll be enjoying this Italian comfort food a lot in the future. You need to prep all of the ingredients first. Once you start cooking the rice, you won't be able to multi-task, because all of your attention needs to be on the rice. Heat the chicken stock in a sauce pan so it will be hot when you're ready to add it to the rice. In a large skillet heat the olive oil and butter over medium low heat. Add the onions and sauté for a minute or two, then add the garlic (if you add the garlic too soon, it could burn and give the garlic a bitter taste). When the onions are clear, add the rice and stir constantly for about 2 minutes. You will hear the rice start to crackle, but it should not toast. Now, add the wine, continue stirring and let the wine reduce. Once the rice has absorbed the wine, add a ladle of chicken stock, keep stirring and the rice with absorb the stock. Every time the chicken stock is absorbed by the rice, add another ladle of hot chicken stock, continue gently stirring and start checking the rice for doneness at about 15-20 minutes. The Risotto is done when it is nice and thick, but not sticky. It should take about 20-25 minutes for the rice to be thoroughly cooked. When it's cooked, stir in the cheeses, and salt and pepper to taste. Serve immediately and top with the chopped chives. Note: There of lots of variations to making a good Risotto and in the future we'll be trying this with mushrooms, vegetables, heavy cream, and different flavored stocks.